We have collected data on 500 participants and are working to outline Phase 2 of ConTRADA. Check back soon for more updates! Consortium for Translational Research on Aggression and Drug Abuse and dependence (ConTRADA) is the first multidisciplinary network in Kansas and in the US to study the neurobiological and psychological causes of the comorbidity between reactive aggression and substance use disorders using cutting-edge techniques and encompassing both clinical and preclinical studies. This consortium is composed of an interdisciplinary team of scholars from top research Programs at KU (School of Pharmacy, Clinical Child Psychology Program, and Genome Sequencing Core) and KUMC (Department of Psychiatry & Behavioral Sciences), with expertise in aggression, addiction and genetics research. Our project will utilize a bench-to-bedside approach to study the neurobiological mechanisms leading to the development of aggression in both preclinical and clinical populations. We will also investigate the interface between drug abuse (alcohol and marijuana) and aggression in adolescence. 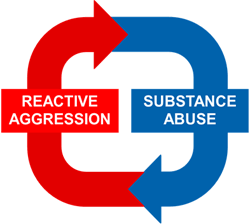 The results of our studies will provide critical information about the pathogenesis of aggression and how illicit substances may act to influence these maladaptive behaviors.